Microsoft released it’s latest version of Windows today. The windows 10 update is available for free download for all Windows 8.1 and Windows 7 users. The latest version of windows comes with a refined user interface along with some new features and apps. To get an upgrade to Windows 10, you must have a licensed version of Windows 8.1 or Windows 7 installed in your computer. Microsoft does not provide this update to pirated versions of windows computers. 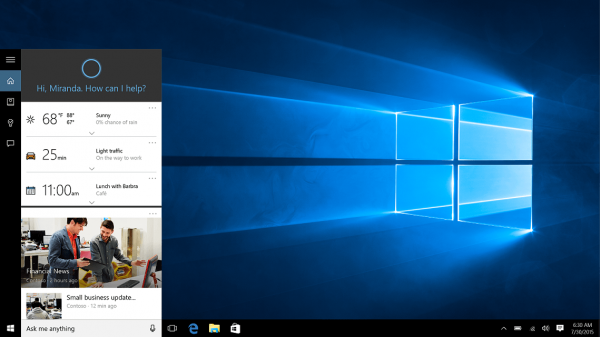 You have one year to download the windows 10 for free. After that, it’s going to cost you. If you have a legal version of windows, then a notification will start appearing in your notification area on your task bar. The notification button will look something like windows’ logo. Clicking on this icon will bring you the app for installing the windows 10 upgrade. You have to sign up and check whether your system’s hardware is compatible with this upgrade. After filling out all the information, all you have to do is wait. Microsoft will automatically download the necessary files needed for the upgrade and notify you later.